Description: Unknown date and photographer. Description: MC 307 and company headed north eraly in the winter. Description: A ton of power sits ready to head out at Rigby Yard. Description: Plenty of locomotives on this day. Description: PanAm Railways crossing Summit Ave west bound. Description: ST SEPO-20 departs from the yard in Ayer. Description: ST SEPO-20 heads through "the Willows". Description: MEC 379 leads a westbound across Town Farm Rd. Description: Photo by my mother, edited very slightly (rotated the image) by me. 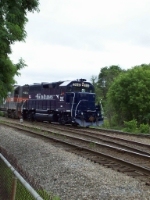 Description: Photo by my mother - not a bad effort for her first effort at train photography - this guy had apparently just gotten repainted in the the ever so odd Pan Am paint scheme (I'm still waiting for Braniff Railroad with Op Art locomotives). Description: EDNM accelerating east after coming off of the Lowell Branch. Description: EDNM heading east through Ballardvale. Description: Motive power of NMED as they head east through Ballardvale. Description: EDNM crawling through Haverhill. Slow order was placed on the Merremack River Bridge. Description: EDNM waits for a re-crew at CPF-297 "Wamesit". Description: Westbound Guilford freight outlaws over the Concord River in Lowell.